Bioenergy Crops Land use effects: More land is available where more biofuels are produced. Are models wrong? 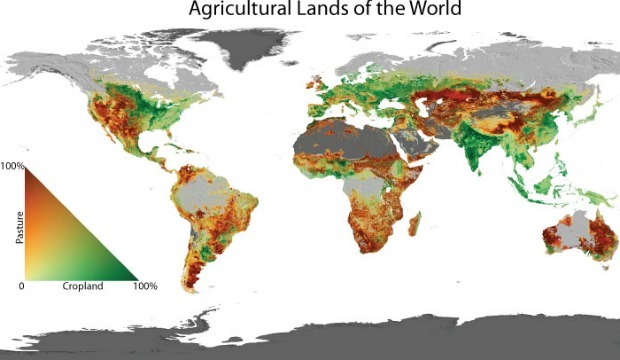 A very recent research publication found harvested area with food crops to be increasing during 2000-2010 period simultaneously with biofuel expansion. Models could be wrong evaluating Land Use effects. Continuing our last post on land use trends we want to share a recent publication. The study (available here) is entitled: “Analyzing the effect of biofuel expansion on land use in major producing countries: evidence of increased multiple cropping“. As the authors mentioned, “biofuel expansion is often considered a major threat for biomass availability for food and feed production and an important source of land use change”. In their publication, Hans Langeveld et al., (www.biomassresearch.eu) have found clear evidence that biofuel expansion cannot be linked to net harvested area dedicated to food production. The relevance of this study reflects the fact that most alarmist claims and critiscism againts biofuel expansion because of land competition could be mistakenly evaluated. The multi-cropping systems that biofuel production can allow is possibly overlooking several sinergies like those of co-products and double cropping systems. Main conclusion of the study is that: “An increase of 14 million ha was noted in 34 major biofuel producing nations over a period of a decade. During the same period, increased cropping intensity generated over 42 million ha of extra crop land – three times the biofuel expansion. Further, an area of 31 million ha of agricultural area was lost (amongst other due to urbanization) in the USA, the EU, China, and South Africa. Consequently, there are strong drivers for expansion of land availability for traditional food and feed markets which has led to increased food and feed crop area. With the exception of the USA, biofuel expansion has not made up more than a quarter of the total loss of agricultural. Now, what comes to our vision is that lignocellulosic crops might allow an amazing opportunity since most of the best alternatives for marginal lands are perennial species (perennial grasses, short rotation coppice, shrubs, etc.) that could occupy unused lands. Additionally they admit and allow food production in same farmlands. A clear example of this is shown in the following articles related to agroforestry, rotations and double cropping systems. 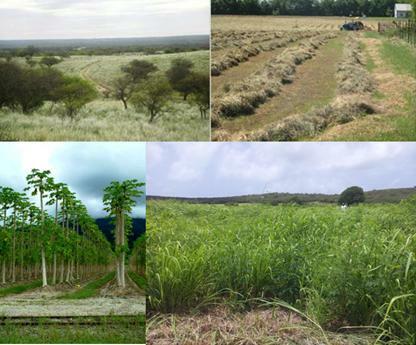 Producing food and lignocellulosic crops for bioenergy uses (solid biomass for second generation biofuels, heat and power applications or biogas) may admit crops like Napier grass, Miscanthus, Arundo donax, Cardoon, Virginia fanpetals and even rotations and double crops with sorghum and oil crops. Another great example of sinergies in land use is shown in agroforestry. Planting trees between strips of cashcrops is very well documented. Biofuels and lignocellulosic crops can be used in the same parcel as shown by several studies we show here when evaluating sustainable alternatives for marginal lands. Hedgerows and unproductive sides of most farmlands have always been a lack of efficiency. As biomass becomes a valued product, farmers and ranchers all over the world can start producing bioenergy crops and biofuels, without affecting food areas and providing MULTI-CROPPING SYSTEMS and several products that will reduce business risks. Biobased industries may take advantage of it as we already see in biomass projects worldwide. Additionally, we think more studies assessing land use changes effects and life cycle assessments should take into consideration marginal lands that are often managed in the same farmlands. Most owners in Brazil or Argentina produce grains and livestock in the same farm. As experts involved with bioenergy crops in South America, our team have been involved several times with growers that have properties from 500 to 10,000 hectares in which we often see different parts of the field that are just NOT USED. The authors of the mentioned publication, suggest that most models do not consider co-products, double cropping systems and other factors we mentioned here such as sinergies between food and bioenergy crops. Our final question is: are most most models regarding biofuels and land use effects wrong? Farmers produce grasses, forages and agricultural products in the same farm as well as they can even produce some forestry. Marginal areas can be treated efficiently to produce biofuel feedstock without affecting food crops and generating more income. Advanced Alternative Energy Company (AAEC) is working to empower both rural areas and populous communities to become more energy efficient and take advantage of home grown biomass to produce biofuels along with electric power for local distribution grids. Here is a posting I’ve been putting out on LinkedIn lately. STRATEGIC ALLIANCE OR INVESTMENT NEEDED FOR LATE STAGE NEW CONCEPT WORLD REPOWERING TECH 6 MONTHS FROM MARKET ENTRY. Greetings, I would like to introduce Advanced Alternative Energy Corp. (AAEC) of Lawrence Kansas. AAEC has developed alternative/renewable energy technology solutions that would be very useful in the United States and other countries. AAEC’s new concept energy technology is designed to serve as the core technology for home, village, business or county scale renewable energy production systems and energy efficiency improvements across the American landscape and around the world. AAEC’s novel new concept technology consists of new fuel combustion and gasification-conversion technology that is designed to provide an on demand heat and power source for various stand-alone uses or to back up solar and wind energy systems and in this way help double the deployment of both solar and wind energy projects. It can also supply liquid or gaseous biofuels such as clean renewable cellulosic fuels or hydrogen and methane when the appropriate back end technology is applied so it can stay viable even when we move into the hydrogen economy. At AAEC we believe humanity needs to repower human activities with much cleaner energy on a grand scale, and that innovation is key to a better future and we aspire to offer homeowners, businesses, towns, cities, counties and utilities our innovative new concept low-budget, low-carbon pathway to greater energy efficiency, energy security, cleaner energy and economic development. And now that President Obama has decided on moving the climate issue to the front burner I’m confident this will be a big boost to what we are offering.